Discontinued: Replaced by SUP JET PolyCarbonate model. The Fiberglass SUPjet is both a quality SUP as well as an electrically powered watercraft. When you want an extra boost or just want to sit back and relax, you simply push a button and the built in jet drive will move you along at 5 mph (8 km/h) for well over 1.5 hours. The emission-free built in jet drive motor is directly mounted in a pocket on the bottom of the board, so there is virtually no drag when not in use. A guard panel covers the pocket so that there is no risk of propeller strikes. The detachable battery pack fits into a hatch on the top of the board, and when you want to recharge the pack you simply unlatch it from the board and charge it using the included charger. Shipping is a $99 flat fee through freight anywhere in the US, due to the large weight and size of the item. 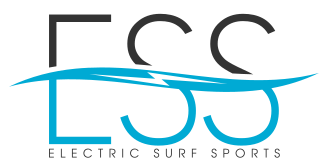 The New Polycarbonate SUPjet is both a quality SUP as well as an electrically powered watercraft. When you want an extra boost or just want to sit back and relax, you simply push a button and the built in jet drive will move you along at 5 mph (8 km/h) for well over 1.5 hours. The board itself is constructed from high quality CNC cut EPS foam and covered with a Polycarbonate shell making this board extremely resistant to impacts and scratches! It comes with an ankle leash and back fin. The power button also doubles as an ankle strap anchor with a uniquely designed magnetic shut off switch that stops the drive system should you fall off. An additional battery for extended playtime. Great for when sharing the board with family or friends. Get over 1.5 hours per charge. The battery pack fits into a hatch in the middle of the board. When you want to recharge the pack, you simply unlatch it and charge it using the included power supply.